Flashbulbs popping non-stop, H.E. Mr. Ban Ki-moon, Secretary General of the United Nations in New York, entered the U.N. General Assembly Hall in New York City. He has attained the status of a rock star. Speaking at the U.N. Day Concert 2009: A Tribute to Peacekeeping in the General Assembly last week, it seems that the Secretary General commands the world’s attention as much as Barack Obama. One year older than the U.N., at 65, the Secretary General spoke of his mourning – the world’s mourning – for the 11 peacekeepers who died last month in a helicopter crash in Haiti. Tragically, more than 2,600 U.N. Peacekeepers have died protecting humanity since 1948. H.E. Mr. Ban Ki-moon recognizing the U.N. Peacekeepers (Photo: John Lee). In an unprecedented effort, the concert was produced by the U.N. Department of Public Information and the U.N. Department of Peacekeeping Operations, in partnership with Culture Project, and with the support of Kelvin Lim, Master Certified Coach of Executive Coach International. Culture Project has been hailed as New York City’s premiere political and social performing arts organization, illuminating and championing the most pressing human rights issues of our time. The concert was kicked off by Master of Ceremonies Isha Sesay of Sierra Leone, now living on London. Isha is the incredibly talented anchor and reporter for CNN International covering Africa. Roberta was followed by a former child-soldier turned international rap star, Emmanuel Jal. From the Sudan, where he fought as a child in their brutal civil war, he was smuggled across the border to freedom by the now legendary British aid worker Emma McCune. The award-winning film War Child chronicles the tumultuous, shocking, inspiring, and ultimately hopeful odyssey of Emmanuel Jal. Emmanuel spoke, rapped, and danced hypnotically to thunderous applause, sharing a message of peace for his war-torn land and beloved Africa. Emmanuel Jal’s music can be heard on the fundraising “War Child - Help a Day in the Life” album, as well as in three ER episodes, the National Geographic documentary God Grew Tired of Us, and in the feature film Blood Diamond starring Leonardo DiCaprio. Jal is, of course, in Wikipedia. 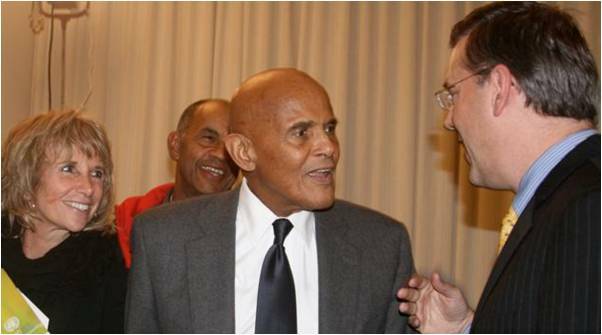 Harry Belafonte with his wife Pamela at the photo op before the concert (Photo: John Lee). One of America’s largest heroes, Harry Belafonte, spoke next. The acknowledged ‘King of Calypso,’ Harry is well known for his artful assimilation of jazz, folk and world music traditions. He is one of the most successful African-American pop stars in history. “I became aware of the United Nations through my mentor, Eleanor Roosevelt,” Harry told the crowd. Harry travelled to Rwanda where over one million people were driven from their homes with so many countless slaughtered in the Hutu-Tutsi conflict. dedication and sacrifice of U.N. Peacekeepers (Photo: John Lee). At 82, he did not disappoint the crowd despite and sang “Day-O” before leaving the stage. His incredible decades-long humanitarian career is covered in Wiki. Cultural appreciation of the world’s peacekeepers then shifted to classical music played by one of the world’s top pianists, Lang Lang, from China. Lang Lang warmly embraced Harry and then sat down to play the grand piano. performed at the Summer Olympics in Beijing 2008 (Photo: John Lee). Heralded as the “hottest artist on the classical music planet” by the New York Times, 27-year-old Lang Lang is the first Chinese pianist to be engaged by the Berlin Philharmonic and the Vienna Philharmonic. He played at the Summer Olympics 2008 in Beijing. 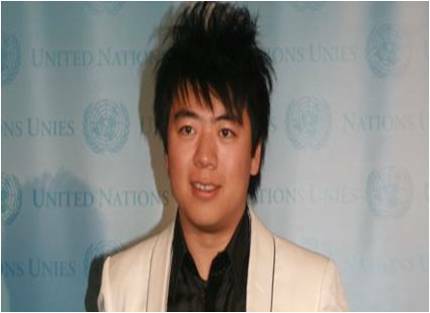 Lang Lang recently appeared in the 2009 Time 100, Time magazine’s annual list of the “100 Most Influential People in the World.” Lang Lang has been a UNICEF Goodwill Ambassador since 2004. Salman Ahmad of Pakistan performed next, with virtuoso tabla player Samir Chatterjee of India. Salman’s vibrant vocalizations lifted my heart out of chest and I felt so alive surrounded by an international audience united by their desire for peace and support of peacekeepers listening to the best voices of the world singing in support. The two performed a competitive duet entitled “Entwined Twins.” Salman compared their duet to the road connecting India to Pakistan. A road of peace and understanding. Samir performed at the 2007 Nobel Peace Prize ceremony in Oslo, Norway. Samir is a firm believer in the transforming effect of music on society. He is working relentlessly towards the musical revival of Afghanistan. Madam and H.E. 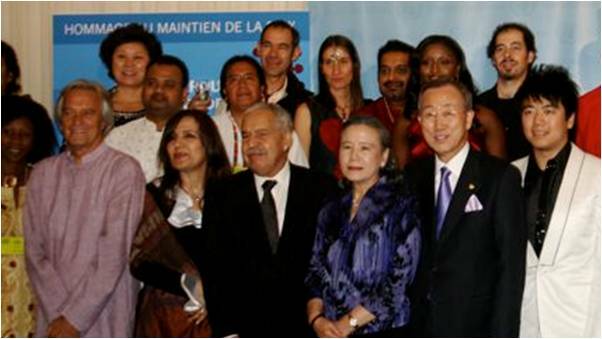 Ban Ki-moon with the performers before the event (Photo: John Lee). Salman is a musician and U.N. Goodwill Ambassador known for popularizing a blend of Western rock music and Eastern/Islamic music called ‘Sufi rock,’ which has been hailed as a cultural bridge within South Asia and between the East and West. Salman founded Junoon in 1990, which has sold over 25 million albums worldwide and has shared the stage with artists such as Melissa Etheridge, Alicia Keys, Sting, Earth Wind and Fire, and Wyclef Jean. With his wife, Samina, he launched an NGO called the Salman & Samina Global Wellness Initiative, focused on interfaith and cross-cultural dialogue, global health and wellness, and music education. 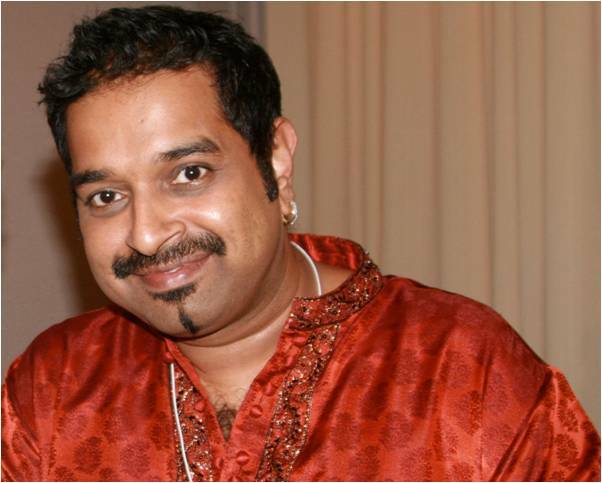 Indian singer, composer, and music producer Shankar Mahadevan. Shankar Mahadevan introduced the next act – the group Remember Shakti – formed by John McLaughlin and Zakir Hussain. John said that Shankar is the greatest singer he has ever known. Melodic, haunting, sacred, his voice reverberated across the General Assembly hall like clouds floating on a windy day. John has developed a unique style of jazz-infused Indian classical music with his band Shakti. Remember Shakti is an Indi-jazz fusion quintet, composed of legendary English guitarists Mahavishnu John McLaughlin, Grammy-winning Indian tabla player, Zakir Hussain, and Indian musicians, Shrinivas Uppalapu on mandolin, Selvaganesh Vinayakaram playing the kanjira, ghatam, and mridangam, and singer Shankar Mahadevan. The song “One,” repeating its singular theme hypnotically, was in the words of the performer about destroying the walls of hatred and extremism by experiencing the world not only with our eyes and ears, but with our hearts. Sister Fa then took the stage. This Senegalese rapper moved to Berlin. Propelled by her own personal experience, she traveled on a self-organized tour last year, “Education sans mutilation,”to sensitize the public to the issue of female genital mutilation. The Xian Song & Dance Troupe made a special appearance (Photo: John Lee). 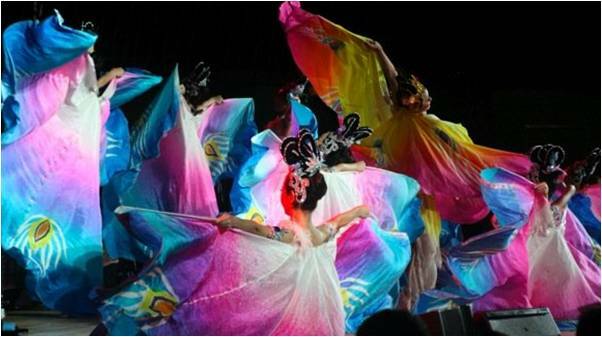 Chinese dancers from the Xian Song & Dance Troupe then floated next across the stage. The graceful women seemed to shed their butterfly wings as the beautiful dance continued. Angelique Kidjo of Benin then took the stage and sang the world-popular Swahili song, Malaika. She brought the house down with her rendition of Axe Mama Africa! The four-time Grammy-nominated and 2008 Grammy-winning, much-celebrated singer, composer and performer began in the Beninese port village of Cotonou. The political turmoil in her country led her to relocate to Paris, the capital of world music, and then ultimately here, where she now resides. Her striking voice, stage presence and her fluency in multiple cultures and languages won respect from her peers and expanded her following across national borders. It also earned her access to humanitarians who sensed the passion in the words of her songs, resulting in her long-term dedication to global charity work. Her extended bio is available onWiki. The Colombian band Aterciopelados performed. Happening, earthy, and exciting, their music took the audience into Latin America. Known for their work with Amnesty International, Aterciopelados recently marked the 60th anniversary of the Universal Declaration of Human Rights by creating a new version of the song “Cancion Protesta” (Song of Protest). The event’s finale was an all-cast rendition of “The Price of Silence.” This is the new rendition of Aterciopelados’ “Cancion Protesta” created in partnership with Amnesty International. Emmanuel Jal and Angelique Kidjo participated in the original project so it was fitting to “recreate” the performance as the finale of this concert. Link TV created a video with Amnesty international when “The Price of Silence” was first released. 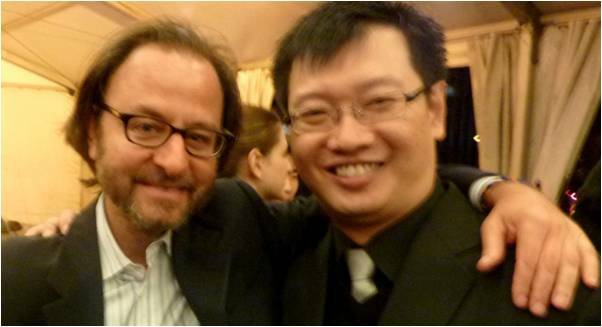 Concert supporter Kelvin Lim of Executive Coach International with director Fisher Stevens. Directed by Fisher Stevens, the film gave the audience one-of-a-kind access and insight into the formidable challenges facing peacekeepers and the committed individuals who serve some of the most victimized and vulnerable populations on earth. See Fisher’s interview here. I, too, have a U.N. Peacekeeping story to tell. In Haiti, two years ago, as founder of Orphans International Worldwide, a misunderstanding with a crowd almost led to the deaths of myself, my staff, and two of our children there. Intervention by the Blue Helmets, after the police had been overrun by the mob, saved our lives. This story was so dramatic I wrote about it in the BBC. Indeed, these soldiers volunteer to go into extreme danger for the good of humanity. They may not singlehandedly be able to bring about Heaven, but through their presence the can help eliminate Hell. Culture Project provides a creative home to dynamic artists who share its passion for challenging injustice, embracing diversity and affecting social change. Culture Project has been awarded the New York Times No.1 Play of the Year and an Amnesty International Freedom of Expression Award. 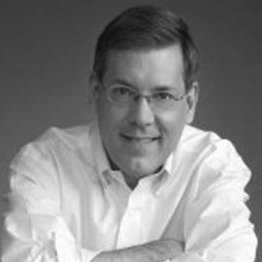 The Culture Project team includes producer Allan Buchman, film director Fisher Stevens, music director Nile Rodgers, television consultants Steven Lawrence, line producer Michael Owen, co-producer Jayashri Wyatt, talent coordinator Julianne Hoffenberg, film editor Lauren Saffa, with public relations supported by Two Sheps that Pass.